Failure to lower cholesterol can lead to a dangerous and even deadly occurrence known as plaque rupture. A build up of Low Density Lipoprotein (LDL) cholesterol on the artery walls is the first step in creating conditions within the arteries where plaque can rupture and release fat into the blood stream. This then can further clog already narrow arteries or cause a clot to happen by lodging the clot in an arterial opening. When arteries become clogged with plaque due to high cholesterol, the walls become hardened. This condition is referred to as atherosclerosis. The arteries also become narrow and make it difficult for blood to flow through. When they become completely blocked a stroke or heart attack is the end result. This condition itself is dangerous, but it also leads to the possibility of plaque rupture. When plaque rupture happens clots of the plaque are pulled away from their stuck position on the artery wall. What is left is an open lesion. This lesion then attracts more plaque in these sticky spots. A greater build up of plaque will happen here causing even more narrowing in the spot. Eventually there will be a thick covering that is susceptible to breaking off again and repeating the process only leaving larger lesions that perpetuate more build up and narrowing. The first line of defense in plaque rupture is to keep blood cholesterol under control. This can be done with a variety of medications, but those also come with their own set of side effects and problems. A low fat and low cholesterol diet coupled with exercise is effective in lowering cholesterol even in those with genetic risk factors. 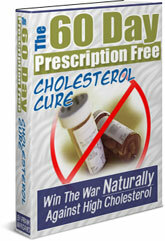 To learn more about lowering cholesterol without prescription drugs, read The 60-Day Prescription Free Cholesterol Cure.